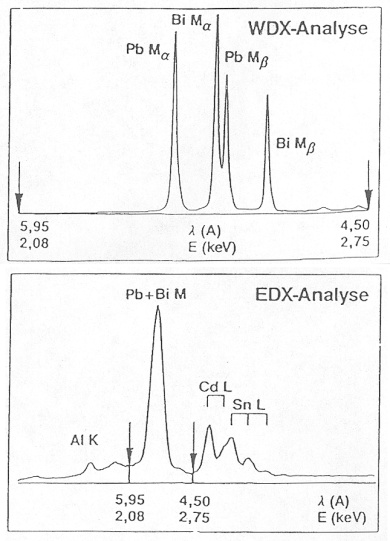 For this purpose, the x-ray quanta which occur on a crystal which is optimum for the energy/wavelength which is to be measured according to the Bragg’s law (n·l = 2·d·sin α) are bent. The x-ray quanta are registered with a proportional counter which lies on the so-called Rowland circle with the sample and the curved analyzer crystal (Figure 4). In the ideal case, the sensitivity of detection is around 0.1% by weight. The energy resolution is around 10eV. This allows the x-ray lines which are superimposed on one another in the EDX spectrum to be separated from each other and quantified with greater accuracy. As each wavelength must be measured more or less in series, the measurement times with WDX are considerably longer. The beam currents required for the measurement are also considerably higher (factor 100) than in EDX. Therefore, the samples must not be sensitive to radiation - not a problem with metals and ceramics.